I’ve been using Android full time for a few weeks now, and it has been an interesting experiment. So far it’s still my primary phone and overall I like it. That said there are some things that need fixing, and since my blog is about rants, here’s the first one: Permissions. 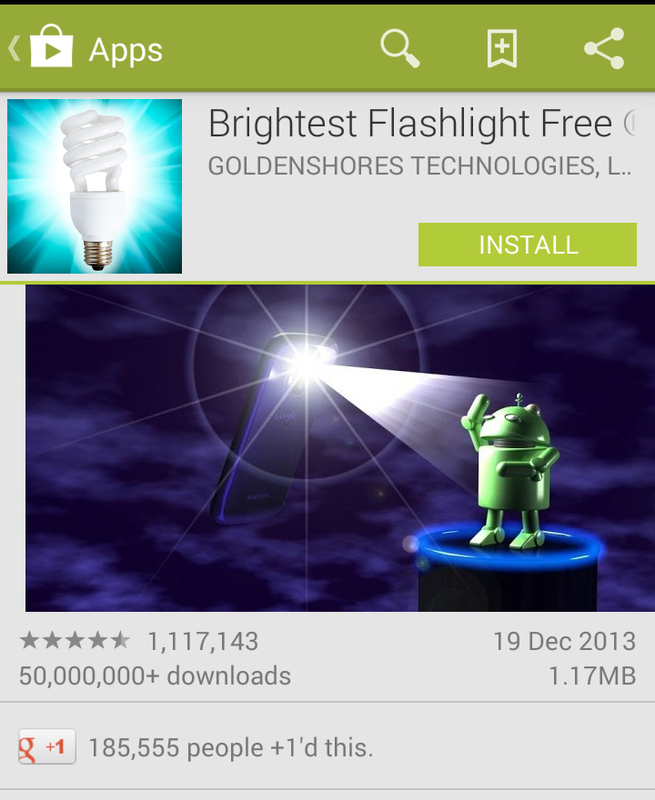 Ok, this app has decent reviews, over 50 million people have installed it and hey, it’s the brightest! Wait what? 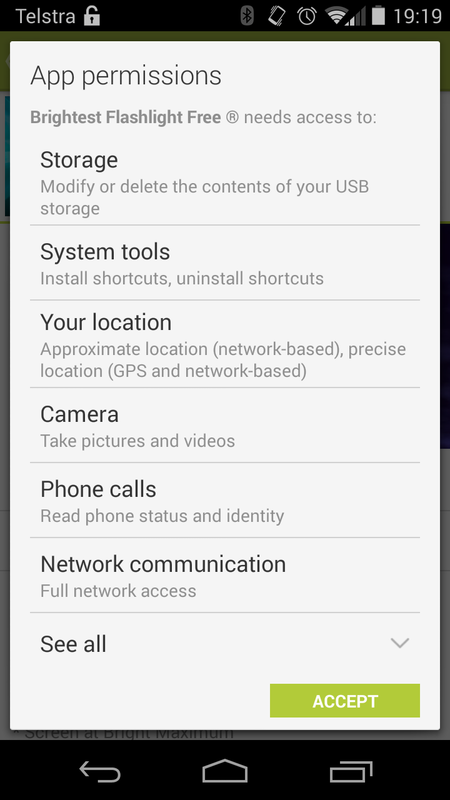 This app wants to write permission to my SD Card, it wants to install shortcuts, access my location, get the ID of my phone and access the network? I mean I know it’s the brightest but all that seems a bit excessive. Android fans will no doubt tell me that this is great, I’ve been saved from this horrible app that is trying to take advantage of me! That’s all well and good, but what happens when a must have app (like Facebook or Twitter) comes along that you really want to use but there are one or two permissions you don’t want to give it? On iOS, annoying popups aside, I can use Facebook but completely turn off its ability to access my location. On Android? Nope. So why hasn’t this been addressed? The more cynical might say because Google wants to do bad things to you, and this gives them an air of having asked you for permission before they do. Really though frameworks like Google Play Services are so embedded into an Android device that Google already has access to almost anything they could possibly want to know about you. My guess is that they know introducing a way to deny these permissions will break a lot of apps and they don’t want to make waves if they don’t have to. I think they need to take a stand, after all it should be every users basic human right to deny Facebook access to their location. So much so that I’m off to make placards about it right now…who’s with me?